Veeam Backup & Replication™ gives Service Providers the ability to generate and use a self-signed certificate during the initial configuration of Veeam® Cloud Connect. This is a quick and easy method to complete the deployment and to test it, but gives lower security to customers, since they cannot verify the certificate, and thus proving the authenticity of the Service Provider. In order to properly protect Cloud Connect and give their customer comfort, the Service Provider should use a proper and generally recognized certificate, issued by one of the Certification Authorities recognized by operating systems. In public key infrastructure (PKI) systems, a certificate signing request (also displayed as CSR or certification request) is a message sent from an applicant (the Service Provider running Cloud Connect in our case) to a Certificate Authority in order to apply for a digital identity certificate. The most common format for CSRs is the PKCS #10 specification. Before creating a CSR, the applicant first generate a key pair, keeping the private key secret. The CSR contains information identifying the applicant (such as a distinguished name in the case of an X.509 certificate) which must be signed using the applicant&apos;s private key. The CSR also contains the public key chosen by the applicant. The CSR may be accompanied by other credentials or proofs of identity required by the certificate authority, and the certificate authority may contact the applicant for further information. 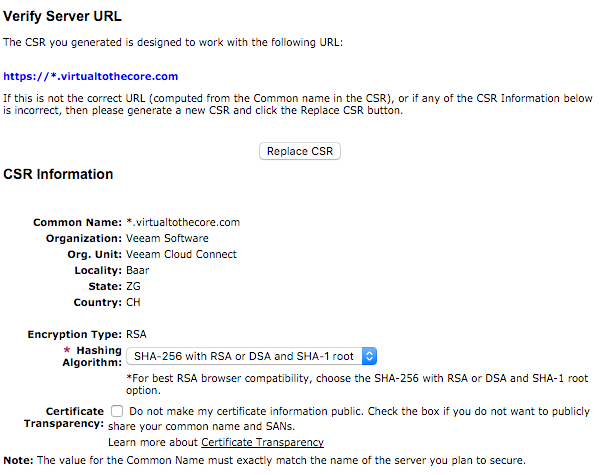 The text parts related to the virtualtothecore.com example are to be changed with the specific values of the Service Provider. To obtain a valid certificate from a Certificate Authority, a proper domain name should be used. Thus, I’ve used for this procedure my blog domain name virtualtothecore.com, and so the FQDN is cc.virtualtothecore.com. You will also have to write your own information in the "Subject" line. Note that, if you want to generate a request for a wildcard certificate, the CN portion of the subject must start with the * symbol. 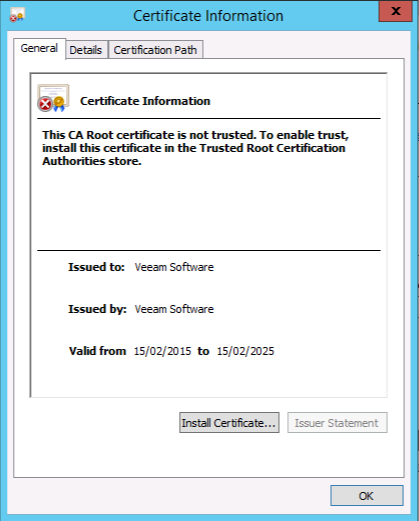 With the Certificate Request correctly created, it&apos;s time to obtain a signed certificate from a Certificate Authority. There are several online services where service providers can get a certificate, and some of them also offer free certificates with time limits that are useful for testing SSL connections. The involved steps vary depending on the selected Certificate Authority, but it usually involves a validation of the CSR, a check against the registered domain via WHOIS protocol to collect the registrant email address and a verification sent to this email to validate the authenticity of the request. NOTE: Random letters have been replaced in the showed certificates. Don&apos;t try to reuse them, as their content is corrupt. They are just used here as examples. Back in the Veeam Backup & Replication server, the service provider has to create a text file in c:\certificates and call it cert.cer. Then, open it with a text editor and paste in it the certificate text was received from the Certification Authority. 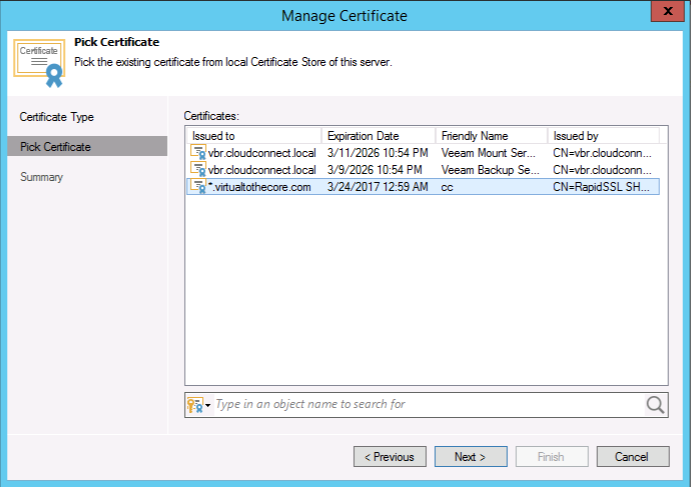 Once the command is executed, the certificate is stored in the local Certificate Store of the Veeam Backup & Replication server. 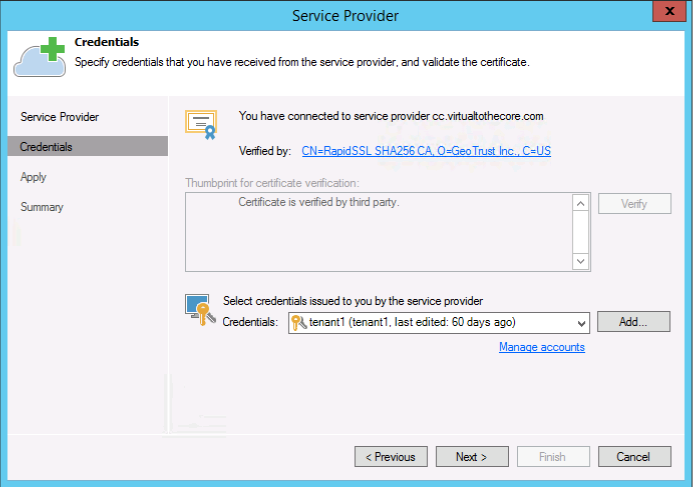 In the Cloud Connect section of the Veeam Console, service provider can now select “Manage Certificates” and use the new certificate. First, choose “Select certificate from Certificate Store”. 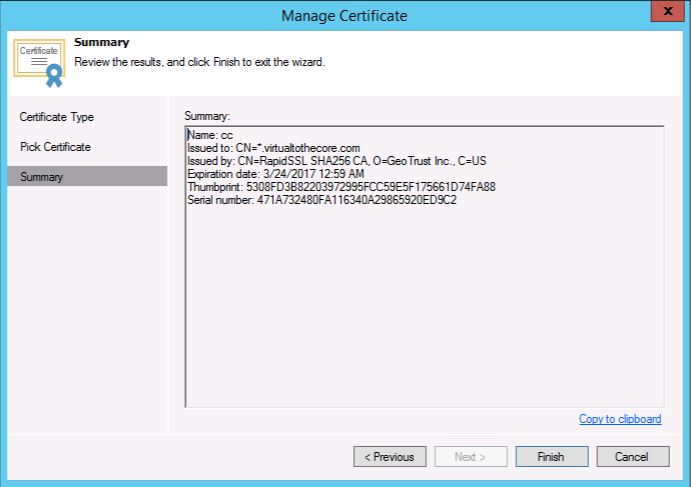 Before completing the wizard, you can see a summary of the certificate parameters. Among them, you can see the Thumbprint of the certificate; this can be sent to customers for additional verification. The certificate is now ready to be used for SSL cyphered connections. 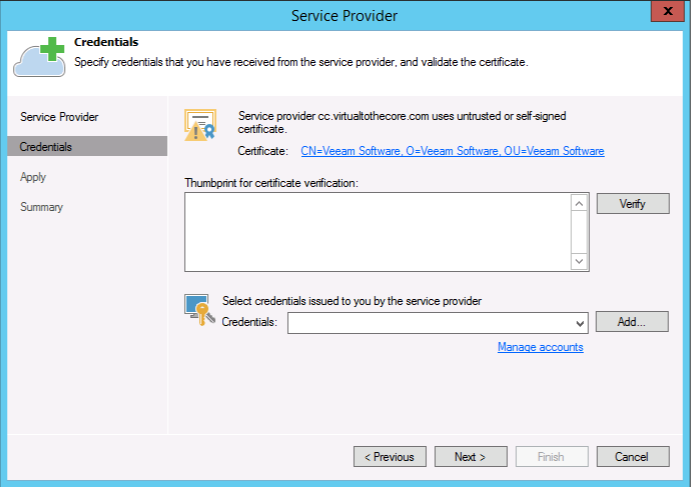 NOTE: To manage certificates, service providers can use the Certificates MMC (Microsoft management console), a graphical interface to interact with the Certificate Store. When configured, it only requires you to select “Computer account” and then “local computer”. 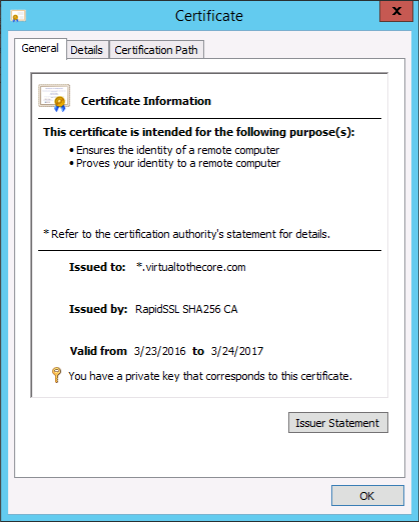 The certificate is issued to *.virtualtothecore.com as requested, it&apos;s valid, and the Certification Authority ("Issued by") is recognized; this means Windows is able to recognize the Certificate Authority that signed the certificate as valid.